Finance theory has it that abnormal outcomes do not persist, that exceptional performance will soon enough become average performance. 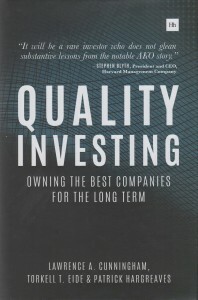 Quality investing involves seeking companies with the right attributes to overcome these forces of mean reversion and, crucially, owning these outstanding companies for the long term. This book pinpoints and explains the characteristics that increase the probability of a company prospering over time - as well as those that hinder such chances. Throughout, a series of fascinating real-life case studies illustrate the traits that signify quality, as well as some that flatter to deceive. 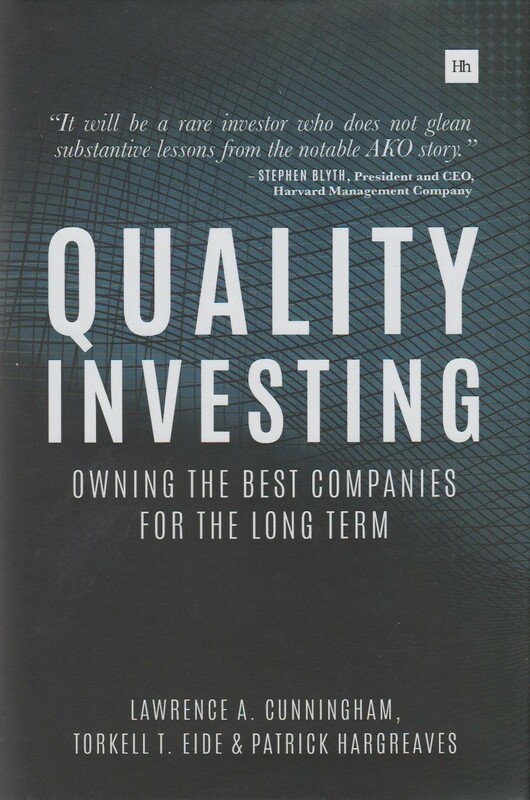 The authors’ firm, AKO Capital, has a strong track record of finding and investing in quality companies - helping it deliver a compound annual growth rate more than double that of the market since inception. Quality Investing sheds light on the investment philosophy, processes and tough lessons that have contributed to this consistent outperformance. Lawrence A. Cunningham has written a dozen books, including ‘The Essays of Warren Buffett: Lessons for Corporate America’, published in successive editions since 1996 in collaboration with the legendary Mr. Buffett; the critically acclaimed ‘Berkshire Beyond Buffett: The Enduring Value of Values’ (Columbia University Press 2014); and ‘Contracts in the Real World: Stories of Popular Contracts and Why They Matter’ (Cambridge University Press 2012). Cunningham’s op-eds have been published in many newspapers worldwide, including the Financial Times, New York Times, and Wall Street Journal, and his research has appeared in top academic journals published by such universities as Columbia, Harvard, and Vanderbilt. A popular professor at George Washington University, Cunningham also lectures widely, delivering as many as 50 lectures annually to a wide variety of academic, business and investing groups. Torkell Tveitevoll Eide is a Portfolio Manager at AKO Capital. He rejoined AKO in 2013 from SKAGEN Funds in Norway where he spent four years as a Portfolio Manager on SKAGEN’s $9 billion global equity fund. Prior to that Eide had spent three years at AKO Capital as an investment analyst, and before AKO he was a management consultant with McKinsey and Company in its Corporate Finance practice. Eide has a first-class degree in Economics from the London School of Economics and Political Science. Patrick Hargreaves is a Portfolio Manager at AKO Capital. Before joining AKO in 2011, he spent eight years at Goldman Sachs where he ran the European Small & MidCap Research team before becoming deputy head of the Pan-European research department. Prior roles include stints at Cazenove and PricewaterhouseCoopers, where he qualified as a Chartered Accountant. Hargreaves has a degree in English Literature from Oxford University.